Voltage [V]: 12 Number of Teeth: 19 Rated Power [kW]: 2 Rotation Direction: Clockwise rotation Number of Thread Bores: 0 Number of mounting bores: 2. Any of the brands above, equivalent or OE supplier brands may be supplied UNLESS customer specifies. OE Part Number (or Equivalent). BOSCH : F 042 002 080 , BSG : BSG 30-820-003 , BTS Turbo : S510853 , BV PSH : 590.533.192.020 , BV PSH : 590.533.192.230 , BV PSH : 590.533.192.235 , CASCO : CST14101AS , CASCO : CST14101GS , CEVAM : 3022 , DA SILVA : 020674 , DA SILVA : JD020674 , DA SILVA : MSQ0146 , DRI : 319052192 , DT Spare Parts : 13.44004 , EAA : EAA-121002 , EAA : EAA-122796 , EAA : EAA-123358 , EAI : 11942 , EDR : 913797 , EDR : 913797N , EDR : 913797X , EDR : EF17973 , EDR : EF17973A , EDR : EF17973N , EDR : WS34808 , ELSTOCK : 25-2463 , ERA : 220157 , ERA Benelux : RE85009N , EUROREPAR : 1638118580 , EUROTEC : 11021350, EUROTEC : 11021350 , EUROTEC : 11090039 , FARCOM : 105008 , FARCOM : 106145 , FARCOM : 106351 , FARCOM : 106832 , FAST : FT74240 , FENOX : ST31127 , FRIESEN : 8080094 , GEBE : 6 0007 9 , HC-Cargo : 112821 , HC-Cargo : 115870 , HELLA : 8EA 011 610-151 , HELLA : 8EA 011 610-152 , HELLA : 8EA 012 080-001 , HELLA : 8EA 012 140-441 , HELLA : 8EA 737 919-001 , HERTHBUSS ELPARTS : 42737919 , HOFFER : 50237 , JP GROUP : 1590300800 , LAUBER : 22.1245 , LAUBER : CQ2011003 , LAUBER : CQ2011030 , LUCAS ELECTRICAL : LRT00202 , MAGNETI MARELLI : 063187051010 , MAGNETI MARELLI : 063280022010 , MAGNETI MARELLI : 063720003010 , MAGNETI MARELLI : 063721245010 , MAGNETI MARELLI : 943212451010 , MAGNETI MARELLI : 943280022010, MAGNETI MARELLI : 943280022010 , MAGNETI MARELLI : 944211214010 , MAGNETI MARELLI : 944280800940 , MAHLE ORIGINAL : MS 422 , MAPCO : 13662 , MAXGEAR : 55-0015 , MEAT DORIA : 50237 , MESSMER : 220157 , NK : 4721351 , PIM : 60761000 , PowerMax : 88213306 , PRESTOLITE ELECTRIC : 20510202 , QUINTON HAZELL : QRS1491 , REMY : DRS3797 , REMY : DRS3797N , REMY : DRS3797X , REMY : RAS34808 , SANDO : 6014101.0 , SANDO : 6014101.1 , SMPE : RES3039 , SNRA : FO9042 , STARLINE : SX 2167 , STELLOX : 06-10034-SX , UNIPOINT : F042S02080 , VALEO : 458371 , VALEO : 458470 , VALEO : 726101 , VALEO : 726901 , VEMO : V25-12-80094 , WAI : 32501N. Any of the brands above / below, equivalent or OE supplier brands may be supplied UNLESS customer specifies. BORG & BECK, FEBI, VIEROL, Or-Equivalent. Please see our full T&C. Our couriers will usually deliver between 7am to 7pm (Monday to Saturday). Estimates can be provided beforehand but prices may differ upon ordering. Any claims after 24 hours cannot be accepted. If you have any problem with your order, please give us a chance to put it right for you by contacting our Customer Service Team. We always aim to reply to all messages within 24 hours. Help is available Monday to Friday from 8.30am to 5.30pm, and on Saturdays from 8.30am to 1.30pm. 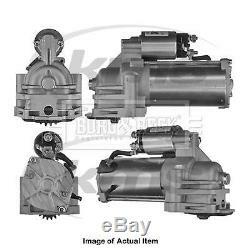 The item "New Genuine BORG & BECK Starter Motor BST2257 Top Quality 2yrs No Quibble Warran" is in sale since Saturday, July 7, 2018.